I am going to use this book for my Gender and Politics class this Summer. This post is worth sharing again. This last month I had the pleasure of reading a book that was well-written, researched, and presented an important argument for and about women in Canadian politics. This book is a must-read for people interested in Canadian Politics, Canadian History, and Gender and Politics in Canada. 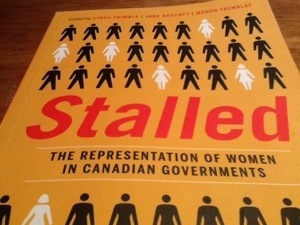 I cannot say enough about this book, Stalled: The Representation of Women in Canadian Governments, edited by Linda Trimble, Jane Arscott, and Manon Tremblay. The book is a 2013 publication via UBC Press and includes chapters written by some well-known names and a strong cross-section of scholars within Canadian Political Science. Yes, you can see that I am enthusiastic about this book. The book covers virtually each province and territories, and includes the different constituent groups within a Canadian context. Each chapter tackles where we have been and where we can possibly go within the Canadian context. The informational boxes at the start of the chapters offers a sketch of the history and perhaps at times lack of progress for women in Canadian politics. This might explain the telling name of the book: Stalled. The book is well-written and appropriate for the lay or academic audience. This book is the perfect addition to a Gender and Politics class, Canadian upper division course or a Comparative Politics course focused on the status of women and politics. The chapters convey the difference and similarities between the provinces and territories, but also offers a great argument for why the Senate should not be abolished. Why? Many gains for women in Canadian politics have been made through Senate appointments. And, this only scratches the surface about the book’s contents. There are dedicated chapters to the House of Commons, Senate, and Indigenous Women and their status within formal Canadian Politics. The foreword by Sylvia Bashevkin does a fine job of setting up the book and the “Canadian political landscape.” The meta-backdrop of the book: we have made gains, but not enough. The various chapters offers the reader glimpses about what is needed, but ultimately we need to understand that the candidates, parties, electoral system, and socialization all are at play with the status of women in Canadian politics. We have lots of work left to do. I will offer a more scholarly review of the book later in a regional Political Science journal. This is a must-read book for Canadianists, Historians, and anyone interested in Gender and Politics! 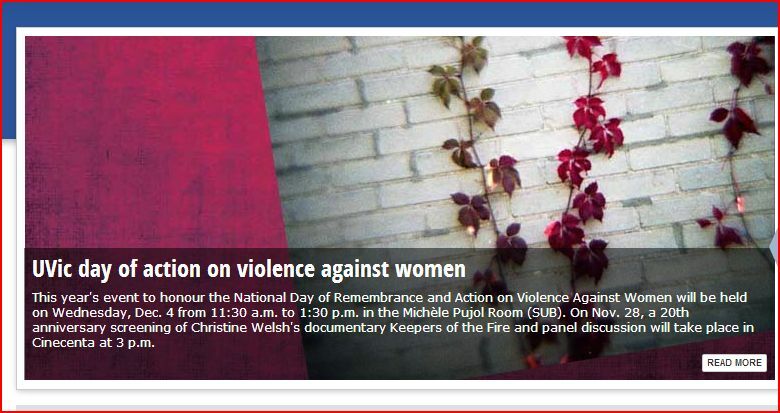 Annually across Canada events are held as a day of action to help stop violence against women. Many refer to these events as part of the National Day of Remembrance. Some of us remember the utter shock and sadness when we found out about the terrible violence that took place in Montreal on that fateful day that 14 women were targeted solely because they were women. 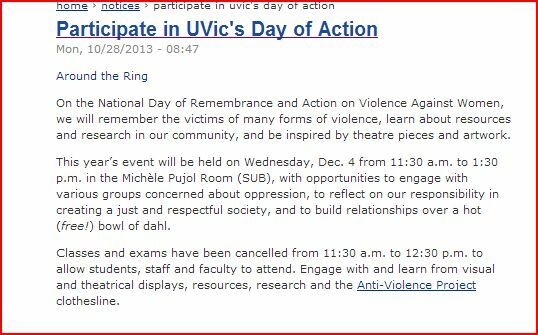 Today we have more events that speak out against violence. Just two weeks ago the international, annual Trans Day of Remembrance was held. It is important to remember that violence can touch all of our lives. Jackson Katz has explained that violence against women is a men’s issue. I concur with Katz and hope that you watch his TED Talk. Find out if there are any events taking place in your community. We are all part of the struggle to stop violence. 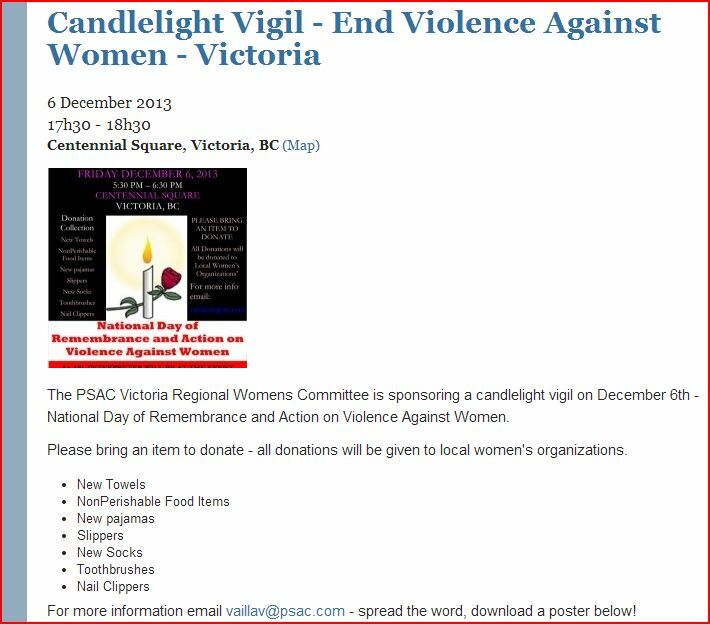 I have attached a screen shot of a campus event (Dec 4th) and local candlelight vigil (Dec 6th). Please share this information.